Samsung has tried their very best to come up with good phones last year. They have released Samsung Galaxy S6 Edge and Samsung Galaxy S6 which performed pretty well. But people want phones like Galaxy Note 4 which provide premium build quality, features and functionality. Samsung Note 4 was not a Phone, we should better call it a Phablet as it features a 5.7inch [551 ppi density] Quad HD screen which is protected by Gorilla Glass 4. Powered by a Snapdragon 805 paired with Adreno 420, there is another variant with Exynos CPU. A 3 GB RAM and 32 GB Storage gives you enough beat to carry on gaming or any other memory hungry activity on your phone. 16 MP camera with 2K video recording and optical image stabilization made it the best camera phone of the Year. You can easily root the device by flashing CWM Custom recovery using Odin. And then you can flash Superuser using recovery to root the device. 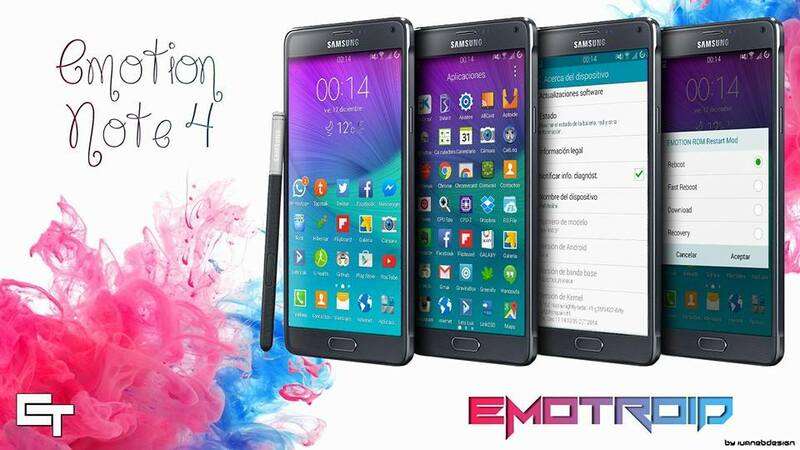 Emotion Revolution is based on the Android 5.0.1 (BOC3) firmware specific to the N910F Galaxy note 4. Developers have tweaked the base of the ROM to make it faster, smoother, and lighter. The developers have also taken care to remove or fix some of the common annoyance in TouchWiz user interface, which includes removing the S Finder, Q Connect and few other shortcuts from the notification bar. They have also lessen the bloat, and more toggles in Quick settings have been added. If you are looking for a no-frill and stable custom ROM, your search ends here. CyanogenMod are light weight ROMs available for Stock Android experience. CM12 for Galaxy Note 4 brings Android lollipop stock UI and experience on your device. The total experience is good but users have reported some minor bugs with CM messenger when you send MMS [use Google messenger to send mms], Google Camera too has some functionally bugs but you can use any other camera app to get full working camera without any fuss. But still installing CyanogenMod 12 Lollipop on Samsung Galaxy Note 4 is a great experience. Omega are well known develop on Samsung platform and the keep tweaking stock ROM for better performance and battery life. Based on an Android 4.4 firmware (ANK4) Omega ROM is available for almost all of Samsung Galaxy S series and Galaxy Note devices. This ROM is based on Samsung TouchWiz stock firmware, which is completely tweaked and optimized by developers, who have removed the bloatware from the ROM. Other features of the ROM includes faster boot time, custom boot animation, 4 way reboot menu, call recorder, faster overall performance, ability to write to external SD card and many more. The ROM also comes with Omega Files app that lets you to install new mods and apps easily on your device, and/or remove any pre-installed apps and services on the phone which can free up an additional 850 MB of storage on the device. With an aim to get everything as stable and fast as possible while keeping it as simple as possible, the developers have made for speed and being light weighted ROM—SimplROM, which is based on N910F Android 5.0.1 official firmware. You can control your music using the Hard keys (Volume buttons), check the CPU stats, customize the number of quick toggles, set the increasing ringtone, customize the dial pad, changing the number colors, set an end call delay, remove the last spoke/message dialog during a call, change the unknown people image on calls, set the PIN scramble and quick Unlock, change the Lockscreen Clock position, Change the carrier text and color and enable or disable the status bar ticker notifications. In case none of the above listed ROMs suit your needs, you can try out Alliance ROM. Every feature and mod in this ROM is optional, which lets users to customize the ROM according to their own likings by only installing the mods they want. The Alliance ROM is based on Android 5.0 Lollipop, comes with 18 different themes. The Alliance control app offers users with all the customization and easy tweak settings you will need.